Alaska's many mountain ranges provide some stunning backdrop locations for the aurora photographer or sightseeing enthusiast. Most notable is the Brooks Range, the farthest north mountain range in the United States, situated directly under the auroral oval, making it a sought-after destination for viewing the aurora. next » | 460 sample images from this category. Try a keyword search to see them all. Aurora borealis over mount Dillon, Brooks Range, Arctic, Alaska. 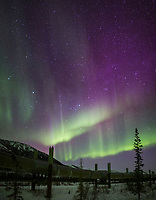 Northern lights and the Alaska oil pipeline, Brooks Range in the distance. Northern lights and over mount Snowden of the Brooks Range, Arctic, Alaska. Aurora borealis over the Brooks Range mountains, Arctic, Alaska. Northern lights reflect in the Koyukuk River, Brooks Range, Alaska. Colorful aurora over Alaska's Brooks Range mountains. Aurora borealis and the Brooks Range. Aurora borealis over the Brooks Range, Arctic, Alaska. The aurora reflect in the Koyukuk River in Alaska's Arctic. The aurora borealis swirls over the Brooks Range mountains, Arctic, Alaska.